My friends in Sacramento know how to start the day! SACRAMENTO (CBS13) — It looks and feels like a bar drink, but it’s served by a barista, and there’s only one place in town you can find this alcohol-free drink. It’s slow-poured into a glass, but this drink dubbed “Morning Beer” won’t make you feel bad for drinking before noon. “You can actually see the coffee kind of cascade down into the cup, and it produces that nice, big head,” said Nathan Welsh with Chocolate Fish Coffee Roasters. You heard him right, it’s a new take on coffee. After perfecting its current pours, the owners of the East Sacramento shop came up with nitrogenated coffee. Welsh says it starts with brewing a bunch of iced coffee. “Then we throw it in a 5-gallon keg, put it under nitrogen for anywhere from five to 6 days, and then after that it’s ready to go,” he said. So, when I left Detroit Monday evening, they had just reached their fourth snowiest winter of all recorded time. 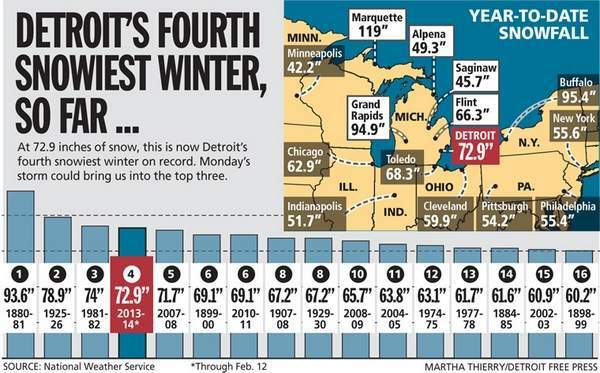 The Detroit Free Press newspaper had even included this infographic to show you snowfall in Detroit and its surrounding areas plus the all-time snowiest winter vertical bar chart. However, by midnight, an additional 3.5 inches of snow had fallen, with more expected to fall into the night, according to meteorologist Steven Freitag of the National Weather Service in White Lake Township. Monday’s storm pushed the total winter snowfall to 76.4 inches, surpassing the record set in 1981-82 and making this one the third snowiest winter in Detroit on record. So, this chart is now obsolete, but it gives you a good idea of how much snow the Detroit area has had this year-to-date. Stay safe, Detroiters. Drive a bit slower and stay inside. If you’ve lived somewhere for an extended time, chances are you’ve collected a lot of stuff you don’t need. Deciding what has value and what’s garbage can be a challenge, but don’t stress out before the moving and relocation company arrives. Check out this guide to determining what to move. Clothing If you still have the pleather pants you wore to the Bon Jovi concert in 1986, for those who are “Livin’ on a Prayer,” your nostalgia may simply be translating into clutter. If you haven’t worn it in several years, you probably won’t again. Donate old garments to a thrift store or organize a clothing exchange party before the van lines arrive. Electronics Get rid of electronics that no longer work, or those you plan to replace. That Atari console may look vintage on your shelf, but if it doesn’t work, it’s purely decorative at this point. You can keep saying you’re going to get your antique record player fixed, but honestly, if it hasn’t been repaired by now, cut your losses. Books Although there is sentimentality attached to that copy of F. Scott Fitzgerald’s The Great Gatsby your first crush gave you, you’ll never crack it open again if it hasn’t been touched since high school. Portable devices such as eReaders make it easy to condense your library, so only hold on to those books you will revisit often. Perhaps even give a loved book as a gift to your friends, local library or relocation movers. Mismatched items You know that one plate left from the set you bought for your first apartment? It might have been cute when you were younger, but you’re a grown up now: Get rid of it. The same goes for that one brown washcloth, rogue dinette chair and lone champagne flute. If you find yourself struggling to part with these items, you can ease yourself into the process by making a box labeled Garbage and another marked Maybe Garbage. Reach out to your friends, as they may be happy to recycle your unwanted goods. Additionally, you can keep track of your old junk via emails and phone calls, even if you’re moving out of state. Our name says it all: Stevens Worldwide Van Lines. If you are looking for an international moving company, you have found the best international moving company in the business. Whether you are looking at an international relocation or simply moving overseas for pleasure, Stevens Worldwide Van Lines has relationships with more than 350 moving companies around the world to provide you with a professional and easy international move. Stevens International offers the resources to provide cultural and language training for those who are moving internationally. Our international move coordinators know and understand the challenges presented by an international relocation and are prepared to make each step of your move as simple as possible. We have a wealth of resources available for you to take advantage of, including real estate marketing services and destination country profiles. Stevens International is experienced in all aspects of global relocation and can make the transition from one country to another as manageable and painless as possible for you, your company or your employees. We have relationships with more than 350 moving companies around the world that provide excellence in international moving.